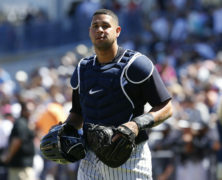 Aside from the rise of Gary Sanchez (pictured), is there anyone else to truly get excited about? Perennial stalwart Buster Posey has been dropping. Jonathan Lucroy went M.I.A. in 2017. Willson Contreras was good, but not as great as we had hoped. Everyone else seems to be just plodding along, putting up numbers that we can’t always count on, and often bringing along some serious baggage. When it comes to fantasy offense, catcher is a scarce position and always has been. There have always been a handful of gems at the top, a bunch of decent mid-draft options that won’t kill you, and then a vast wasteland. The problem is, there are not enough desirable top-end and mid-level options to fill every roster, especially not in 2-catcher leagues. In fact, 2016 was the low water mark when it came to top backstops; we are now re-stabilizing. But the overall pool is still thin. Of all catchers that BABS lists as mid-timers (minimum 300 plate appearances) only 26 possess at least one positive asset. That’s up from 24 last year. So, if you are in a one-catcher league, no sweat. If you are in a 15-team mixed league with two catcher spots, there will be four slots filled with backstops that will do damage to your team. And if you are in a 12-team AL/NL-only league, almost half of your 24 catcher slots will be occupied by bats that will hurt you outright. Of those 26 catchers, only seven are multi-asset players (down from 10 last year), meaning that they are above average in at least two skills (typically, power and batting average). Five other power guys are batting average liabilities. So, how do you draft catchers this year? In the past, I suggested that you avoid overpaying/overdrafting the top guys because the position scarcity premium was too high. Instead, grab a pair in the middle ground, overpaying slightly, if necessary, because the premium is not as steep there. But above all, do everything you can to avoid the end-game wasteland. This year, there may be another path. To start, there are only seven catchers rated as (F) full-timers, and frankly, few are worth chasing for the additional playing time alone. So let’s group them all with the mid-timers and evaluate them together. Gary Sanchez tops the list and his ADP doesn’t seem horribly out of place among other (PW,AV) players, like the volatile Bryce Harper, the aging Nelson Cruz and the hobbling Yoenis Cespedes. A second round/late $20s buy maybe slightly risky for a catcher, but the top shelf power may be worth it. The next backstops off the board are typically Willson Contreras, Buster Posey, Sal Perez and J.T. Realmuto. They are not bad picks where the ADPs are slotting them, but there are a few other interesting names worth waiting on. Mike Zunino has prodigious power – he’s the only (P+) player in the catcher pool – and he’s not going until ADP 166. In the current NFBC/AFL Invitational (50-round draft and hold), I have the No. 2 seed and took Sanchez at the tail end of the second round (pick 29). Then I grabbed Zunino with pick 152 at the end of round 11. According to BABS, I potentially have the best two catchers in the pool. After you get past Jonathan Lucroy (an interesting speculation) and Evan Gattis, the rest of the pool is composed of single asset players. There are a few opportunities to play the market. You could pass on Posey in lieu of Yadier Molina – or even deeper, Austin Barnes – and not lose much, skills-wise. Robinson Chirinos gives you a 100-spot discount on similarly-skilled Welington Castillo. Digging deeper, you could spend real money on a Travis D’Arnaud or tuck a Francisco Cervelli on your reserve list instead. Looking for a lower-risk catcher? They are easier to find this year; about a third of them have no major liabilities. That’s an improvement over last year when only eight catchers avoided the black marks of injury and/or inexperience. Should you find yourself closed out from positive valued players, remember the adage, “first do no harm.” In catcher terms, that means finding guys who will not get many plate appearances but could provide some positive assets. If you are willing to budget for the risk, the seven players at the bottom of the list could be of help. The master BABS list contains ratings for over 100 potential contributors at this position. “Contributors” may a bit of an oversell. 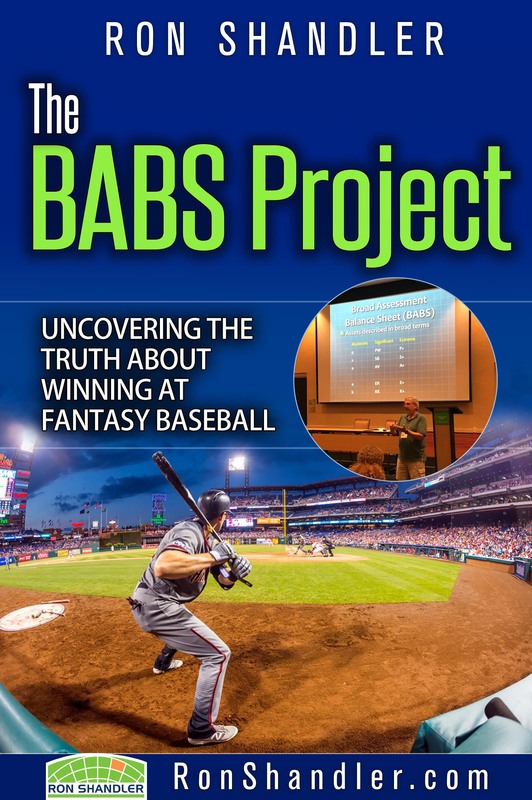 Complete details about the Broad Assessment Balance Sheet (BABS) can be found in the PDF eBook, “The BABS Project: Uncovering the Truth About Winning at Fantasy Baseball” for only $5. The Kindle version is available at amazon.com. 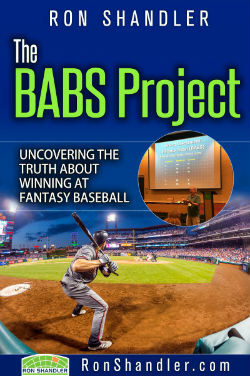 Or, get the eBook for FREE with a one-year membership to the RonShandler.com website for $19.95. Here is what you get with your membership. I play in a league in which we can keep five players for a three year cycle. This is a total re-draft year which means I can keep a player for the next three years, with these rules, does it make even more sense to spend a 2nd round pick on Sanchez. I think he’s the only catcher anybody would even consider keeping. Eh, I don’t know. Sanchez sure looks good now, but catchers are notorious for their inability to string together profitable seasons. He might be good this year, maybe next year, but I wouldn’t bet on three years in a row, especially after he just already had two profitable seasons. Not a bet I would take, personally. 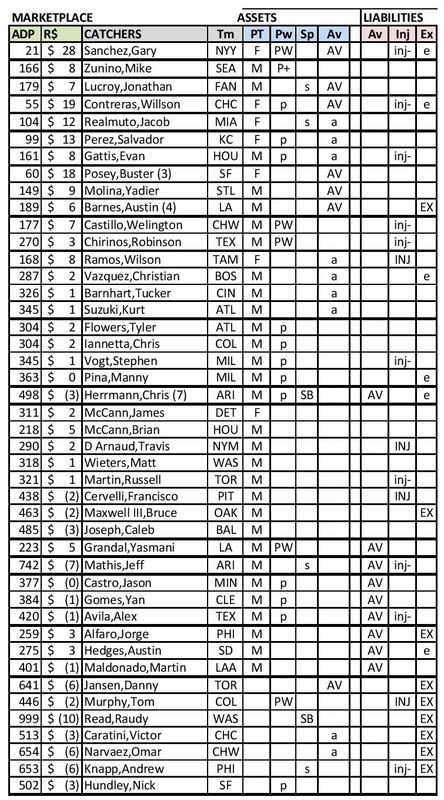 I didn’t see Devin Mesoraco on this C list. I know something on him breaks or sprains when it gets windy, but is there a chance he could still be a factor – even at a buck – over some of the guys on the list? Big salary, walk year, etc. I know 2014 is really in the rear view mirror, but… any chance he’s a sleeper? Thanks. Everybody is a sleeper at some level. If you are in an NL-only, maybe you take a shot on him as an end-game #2 catcher — he is only slated to be Barnhart’s backup, after all. But otherwise, there is too much risk. I have spoke to you about my league settings before they’re a little different 9 hitters (c, 1b, 3b, 2b, ss, 3of, u) 9 pitchers (5sp, 3rp, up) and 5 bench players 5×5. There are 16 teams in the league and a small $150 salary cap. What are your thoughts on my two catchers keeper value? They’re Barnes at $5 and/or Alfaro at $2. Both will not impact me not being able to keep other players. For me, foregoing those $2-$4 gives you some extra cash to land an impact player. If you were out when Chris Sale hit $35, this lets you go to $36, or $39. It is pointless to nickel-and-dime keeper decisions at the single dollar level if you’re looking at potential profit of $5, if that. Use those dollars to get something of real value. Barnes/Alfaro are not going to buy you a title; neither will downgrading a catcher to $1 lose you one (but pick carefully). But being able to go an extra dollar to get an impact player WILL be a difference-maker. If he does, you ‘re probably looking at a (M,a) rating at best. I own Contreras. Do I keep him or try and grab a Zunino type in the draft in an OBP? He could potentially cost me a valuable keeper, but I do love him and he was my dynasty pick two years ago. You own a bird in the hand. Contreras is a perfectly good player. Don’t overthink. Ron, what if that bird, Realmuto, would cost me 9 5×5 roto dollars. Still keep? Hitting atop Mia order would only help, right? Would move to Hou or Was change outlook? Thank you. Mixed league? NL-only? In a vacuum, $9 is a decent price, especially if there’s any type of inflation. Clearly, the move to a team where he can accumulate more than 30 runs and RBIs will help his value. 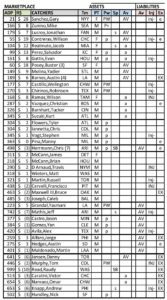 Is it just me, or is the grid very blurry and unreadable? I noticed this on a few others as well. There are a few folks who have had trouble – if you adjust your resolution or increase/decrease the size of the image on your monitor you should be fine. We’ve changed the formatting for those charts in later articles.